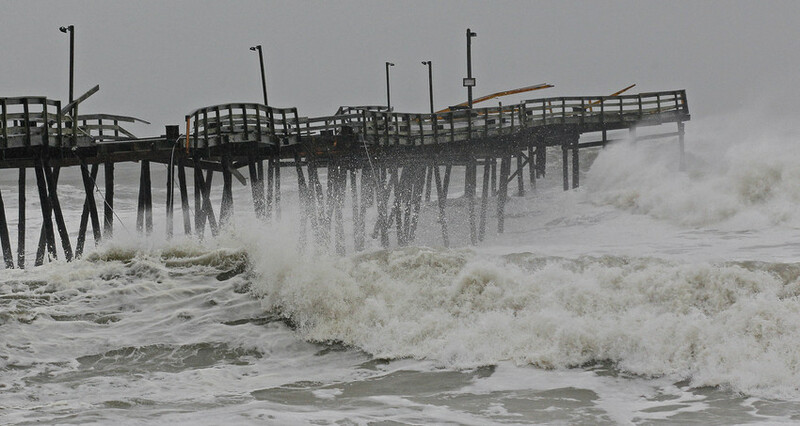 Waves from Hurricane Sandy crash onto the damaged Avalon Pier in Kill Devil Hills, N.C., Monday. Don’t think for a minute that Superstorm Sandy has put the presidential campaign on hold. Both President Barack Obama and GOP challenger Mitt Romney’s teams have merely pivoted from overtly political to less so. For both efforts, it’s crucial to look sympathetic and not opportunistic. And for both, the suspension of normal campaigning has serious risks. For Obama, whose campaign depends on the ground game at this point, suspension of early voting in crucial East Coast states is a huge blow. Maryland suspended early voting completey, and sites in Virginia and North Carolina were forced to close. He’s also been effectively shut down as a campaigner. Surrogates such as former President Bill Clinton and Vice President Joe Biden are carrying the load, particularly in Ohio. The president is, of course, haunted by what Katrina did to his predecessor and has turned the White House into a command center. Calling governors, promising whatever help is needed, Obama’s done a good enough job so far to earn praise from one of Romney’s top surrogates: Gov. Chris Christie of New Jersey, where Sandy made landfall last night. Obama signed a major disaster declaration for New Jersey, skipping a bunch of red tape to expedite aid. "I can&apos;t thank the president enough for that," Christie said. "Cooperation from the president of the United States has been outstanding. He deserves great credit." In the meantime, Romney has learned the lesson of Benghazi and is mostly shutting up. At an Ohio event, he’s collecting donations for the Red Cross, not his campaign (this followed Obama’s lead Monday night, when he sent out a fundraising letter for the Red Cross through his campaign list). Tone is crucial for Romney at this point but with the huge blackout, whatever he does might have little impact either way. In the meantime, the blackout means the last minute barrage of ads against the president are also useless. On the follow up specifically about disaster relief, he said this: “We cannot — we cannot afford to [have federal disaster relief] without jeopardizing the future for our kids. It is simply immoral, in my view, for us to continue to rack up larger and larger debts and pass them on to our kids, knowing full well that we&apos;ll all be dead and gone before it&apos;s paid off. It makes no sense at all." In other words, to provide federal help during emergencies caused by nature instead of bringing down the debt is immoral. As far as Romney&apos;s concerned, that black out might in fact not be so bad afte all.